Friends, today’s design resource is a set of 8 Photoshop text and layer styles. 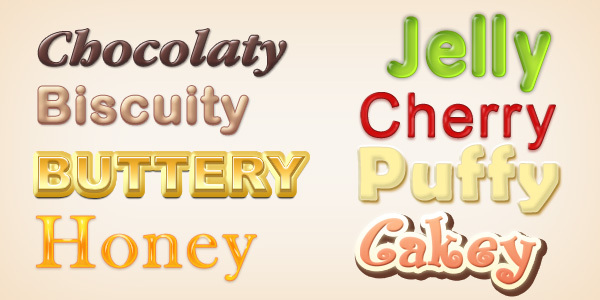 Basically, the layer / text styles are an inspiration taken from bakery items such as chocolate, biscuit, cheese, honey, jelly, cherry, puff, and cake. So tasty to create some yummy text, button, icon effects for your designs… right!?! The text styles comes in .ASL and PSD files. Download and install them on your Photoshop and apply the styles to your desired graphics easily. You may also like to download retro text styles, metal text styles, party text styles.